Note that despite living in Birmingham at the time, the family still returned to Harborne to baptise Isaac and Mary Ann in 1826 and 1829. 2) The ALLENs were eventually located on the 1841 census in Churchill, Worcestershire near Kidderminster (there are quite a few Churchills I found out!). The family lived ‘next door’ to the Rectory but I am still unable to determine the exact whereabouts so far. Isaac and daughter, Mary were still there in 1851 – his wife Ann had since died. 3) The original Halesowen (Worcestershire) registers have not yet been seen by me but I was able to find a transcription here which gives the marriage date of Isaac ALLEN (bachelor) and Ann Phillis GEALEY (spinster) – both of the parish – as 26 August 1821. 4.a) The 1851 census gave Isaac’s birthplace as Moseley, Warwickshire, and sure enough an Isaac was born to Jeremiah & [Phebe] Allen in 1792 and baptised at the Moseley parish church – St Mary. 4.b) I have not been able to view Halesowen baptisms c.1790 so have not yet located Ann Phillis Gealey’s baptism but believe that is where she may be found. While tracing back through the life of James YEOMANS recently, I came to a standstill at his birth. There were two likely baptismal records of Josephs whose fathers were both called William but which one was the correct one? One had a mother called Mary, the other, Elizabeth. Never mind, I thought, I’ll just use the censuses. The problem was however, that I couldn’t find Joseph YEOMANS in the 1841 census – the one that could give me his parents names and take me another step back in the line. I had Joseph’s marriage record so knew he was married in St. Philip’s Church, Birmingham in 1845 (now Birmingham Cathedral) and the ’51 and ’61 censuses located him there. A general name search (variants on and off) and an area limiting search came up with nothing. It’s possible he was living/staying elsewhere that night but also possible the transcription was askew. The marriage certificate gives his father’s name as William YEOMANS – a tin plate worker. Joseph’s precise age is not given, only ‘of Full age’ to indicate he was at least 21. The 1851 census gives 27 which means he would only be 17 in 1841 and likely (although not guaranteed) still living at home. Locating it would hopefully solve the issue of which mother was his. William and Mary YEOMANS were found quite easily, yet I could not find William and Elizabeth. Presuming it was likely a different spelling of the name, Yeomans, I searched using a variety of name combinations. Finally, I searched for Jos* Yeomans and huzzah! There he was WITH his father William and mother, Elizabeth, who had been recorded as Wm & Elizth. For further proof this was the right family, both Joseph and his father were recorded as Tin Plate workers AND they were living on Summer Lane (the address given on Joseph’s marriage certificate). His age was a couple years out from the birth years given on subsequent censuses but it fit very well with the 1822 baptismal record. Interesting to note that he gives his age as 1 year younger than his wife, Catherine on the 1851 census and 1 year older than her on the 1861 census which are both 2/3 years younger than his actual age. I have done a LOAD more research on the Lamb/Rollett family and found what I believe are answers to some of the questions I posed in my previous post (which I will write about later, I promise) but I’ve just come back from a quick trip to Derby and inputting the information into my online tree has thrown up ANOTHER question. While at the Derby Local Histories & Family History Library, I found the baptism entries for William Henry LAMB & Rebecca TAYLOR’s children on a parish register microfilm. 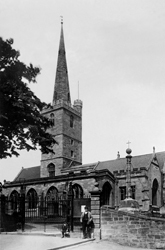 Their 5 oldest children were baptised at All Saints, Derby (which is now known as Derby Cathedral) all on the same day – 11th March 1849. Beside the first column, the children’s actual birth dates were also recorded – the eldest, John, being born nearly 10 years previous. This is not that unusual and I have come across this before in my research over the years. However, these children had already been baptised as infants in St Alkmund’s Church! Now, I have heard of some children being re-baptised after changing religions or denominations; I’ve even heard of some being re-baptised after moving to a new area. But St Alkmund’s & All Saints are both Church of England AND within a stone’s throw of each other so those explanations don’t fit. Researching the church of St Alkmund’s shows that it was rebuilt 1844-46 (during the time some of the children were originally baptised); perhaps there was some issue surrounding this? The only other thought that has come to mind is some kind of scandal where there were concerns the children were not legitimately baptised. If anyone can shed some light on this, or pose an alternative explanation, please contact me. On the hunt for William’s death certificate, I realised I hadn’t attached an 1861 census record to him yet. I checked that William did indeed have a sister called Sarah (baptised 18 Apr 1797 in Morchard Bishop, Devon to the same parents, John & Mary) and then checked for a marriage between a Sarah WREFORD and a man named BROOKS. It all checked out and I am confident that the William living with his sister in 1861 IS my William WREFORD (b. 1793). I ordered the death certificate and hoped there was some clue as to how he ended up in London. Unfortunately there was not. Since then, I learned that both his eldest son William (1817) and his daughter, Elizabeth lived in London at the time and am still tracing his other children. More information can be found in my ‘Wrestling with Death‘ post. In my last post, I mentioned that I wanted to find out more about the mystery grandson, William CASSANS, found staying with the ALLEN family in the 1851 census. I’ve actually wanted to do this for years – ever since I first found this census record. If I could find who his mother was, I could add another child to that family and perhaps open up more doors. Even though I guessed it was a spelling issue, I was never able to locate this child anywhere else. To be fair, I wasn’t that bothered since he wasn’t a direct line from me, but seeing his name again bugged me and I set about to solve this mystery. William CASSANS was only 3 years old (so born c.1848 in Gillingham) and staying with his grandparents William Henry & Sarah ALLEN in the 1851 census. A search within two years of 1848 on findmypast, brought up the birth of a William James CUSSANS, registered in the Medway area, and a death in London that looked ‘promising’. A search for census records under this name found someone of the right name, age and birthplace married to a Jeanette in London 1881. 1873 fits with the age of the first child (6 years in 1881, therefore born a year or two later in 1874/75) but notice there is also another possible bride listed. Ordinarily, a certificate would need to be ordered to actually prove which of these women was the one he married, however since this marriage took place in London, I was able to find the parish register entry in the London, England, Marriages and Banns, 1754-1921 records on the ancestry website. As well as proving the marriage, this record gave his father’s name as James CUSSANS, an upholsterer. Tracking William back to the 1861 census finds him in London with his parents, James (yay!) and Emma, who was born in Faversham, Kent (double yay!). But was his mother an ALLEN?